Original / Genuine 4400mah PC-VP-WP104 Battery For NEC PC-VP-WP103 PC-VP-WP12(Li-ion 11.1V 4400mAh). Fast Shipping in USA. This is a 4400mah PC-VP-WP104 Battery For NEC PC-VP-WP103 PC-VP-WP12. OP-570-76978, Op-570-77003, OP57076978, Op57077003, P-WP103, PC-VP-WP104, Pc-vp-wp127, PC-VPC-VP-WP103, PCVPWP103, Pcvpwp127, . NEC PC-LL350VG Laptop Battery, NEC PC-LL700VG6R Laptop Battery, PC-LL730TG, PC-LL750TG6R, PCLL350VG, PCLL700VG6R, PCLL730TG, PCLL750TG6R. 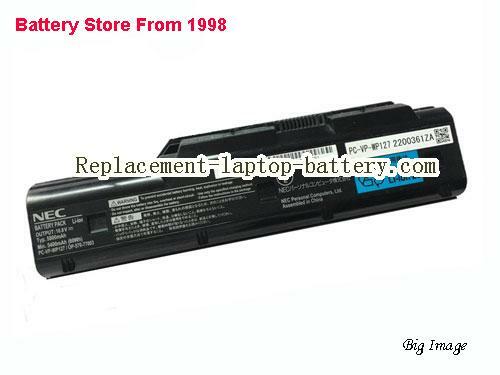 Online shopping for high quality and cheap 4400mah PC-VP-WP104 Battery For NEC PC-VP-WP103 PC-VP-WP12. All NEC Laptop Computer Batteries and NEC Replacement Laptop Batteries are 30 Days Money Back, 1 year warranty.